Not long ago (in June 2004), the celebrated historian, Sardar Khushwant Singh, in his popular column (‘With Malice’) raised the question: “Did Guru Arjun rewrite Kabir And Namdev?” As a student of Gurbani, I wanted to share my understanding of Gurbani with the aspirants and the general public on this sacred and sensitive subject and sent this rejoinder to press. But they declined to publish it, against all ethical norms of their responsibility to undo any misinformation! Then I wrote to the legendary author, with a request to put a word to the concerned editors to publish it in the interest of the readers, academicians and historians. He thanked me in reply, but expressed his inability, saying that, “I am not in a position to ask editors to use your article. I have no personal relations with any of them. My relations with the papers are based on contract with their owners”. Coming to the original text, he wrote, “I will not open up a public debate.” However, he had publicly raised the question regarding the sacred text, casting doubt and creating confusion among the general public. With due regard, I would like to suggest that this question pertains to the Sikh holy text and the best forum for raising the question would be the academicians and theologians. On the other hand, he has done service in inviting the scholars to elucidate the historical and linguistic aspects of the hymns of Bhakts Kabir and Namdev. I appreciate his probing statement which is most sober and inspiring, and a role model to follow for all the other Sikhs, that; “Having spent the best part of my life working on Sikh history and translating selected passages of the Gurbani, I felt I owed it to myself to read the Granth Sahib from cover to cover”. His style of study, by keeping the translations beside him, is commendable. Actually speaking, this is the only correct method of understanding any holy text. No single author could be taken for granted to be correct in interpreting whole of the text. On my part, I have been studying Guru Granth Sahib several times in the same manner, having translations besides me, along with pronunciation key and the Mahan Kosh (Dictionary of Gurbani) by different authors, in Punjabi and other languages, for cross-checking the different interpretations. I have been taking daily notes of the text on different subjects since the last three decades. I did not suspend this habit even while I was detained under TADA in 1984-85 for seven and half months! I had indeed completed six readings while in jail. I staunchly believe that Guruvani is an object of learning and not of worship. Unless we learn from it, the relationship between the Guru and Sikh is not established. If we do not follow this principle, a Sikh will be presumed to be a worshipper of the holy Book, but not the follower of the living Sri Guru Granth Sahib. This is against the ideology and basic philosophy of Sikhism, as we are the worshippers of “Formless One Absolute”. In terms of language, it is a universally admitted fact that the languages are bound to change, in style and vocabulary, by the influence of time, distance, and environment. This fact is evident from the vocabulary of Granth Sahib that no Guru, Sufi or Bhagat has used any single language of his own. It seems they addressed their audience in the popularly spoken languages, which could be easily understood by them. Most of the verses are recorded in a fashion of conversation, questions posed by the audience and the answers given by them, to clarify the doubts and confusion. That is how they have used the vocabulary of several Indian and foreign languages. It shows the travels of the persons and not of the languages of Guru Granth Sahib. No language of the world has retained its originality for a long period of time. To judge it as right or wrong, on the basis of the language of the olden days, with the parameters of the present day usage, is not justified. These days many archaic languages are much more rewritten according to the present linguistic science and our needs. Coming to Bhagat Nam Dev (1270-1350), along with Sri Gyan Dev, (popularly known as Sant Gyaneshwar) and other saints and devotees from Maharashtra, he travelled to North India. In Delhi, he was imprisoned and persecuted by Sultan Mohammad Tughlaq. This he has narrated in his hymns included in Guru Granth Sahib. He travelled up to – and stayed – for about 20 years in Punjab. The period of stay might be different for lack of authentic evidence. And the use of Punjabi and Persian words in his Marathi language is clear evidence for this. Indeed, one of his hymns is in classical Persian (Farsi). In those days, the Persian language did not influence the Marathi language of Central India, as it had only penetrated in Punjab in the North till then. In Punjab there are several Gurdwaras built in memory of his travels. 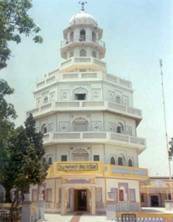 One of the famous Gurdwara is in village Ghuman, of Gurdaspur district, which was built by Sardar Jassa Singh Ramgarhia (died in 1783) chief of one Misl. Bhagat Nam Dev’s interaction with the people there would have definitely mixed his own Marathi language with local dialect. In view of the above evidence, it cannot be said that anybody else rewrote his verses. The author has referred to the statement of a Maharashtrian, the late Mr P.N.Oak, I.C.S., who was studying writings of Maharashtrian Saint-poets who, after scrutinizing Gurbani, came to the correct conclusion, saying, “It is Namdev but the vocabulary is different”, supports my foregoing contention. Regarding Bhagat Kabir’s compositions of acrostics, it is true that, by that time the Gurmukhi alphabet was not yet fine-tuned. But he did not write basing on these alphabets. In those days, Sanskrit was based on 52 (Bavan, in Hindi) letters, with the nomenclature called “Bavan Akshri”. It was called same as “Bavan Akhari” in Punjabi. The Gurmukhi script was introduced with 35 (Painti in Punjabi) letters with the same nomenclature, and was called as “Painti Akhari”. In Rag Gouri, there are two compositions of acrostics, by name “Bavan Akhari”, one by Bhagat Kabir(on page 340) and another of the 5th Nanak, Guru Arjun Dev (page 250). The composition of Guru Arjun Dev is in the then prevailing format of Punjabi. Both of them are written based on “Bavan Akhari” of the Sanskrit, and not on Gurmukhi letters of “Painti Akhari”. There is no binding on the proofreaders and publishers to maintain the originality of the text in toto; rather, they change the language of common understanding of their period. For example we can see the Bhajans of Bhagat Meera Bai. Her original version was in Rajasthani, Brij and Gujarati; she never wrote in the present day Hindi. But most of the texts available in the market today are in easily understandable Hindi. Like this, there is every possibility of Bhagat Kabir’s bani getting modified at every stage during the long period of six hundred years. When it is inscribed in Adi Granth Sahib the predecessor of Guru Granth Sahib, which was compiled in 1604. There is no possibility of alteration of even a single word in this text as it has become the most sacred Scripture of the Sikhs installed in Harmandir Sahib (Golden Temple). In other words, if any text of the Bhagats and Sufis in the present publication has to be compared and adjudged to be authentic and original it is from the text of Guru Granth Sahib alone, and there can never be any criterion other than this. In Rag Asa, there are two other compositions of acrostics employing the letters of “Painti Akhari” of Gurmukhi script, one of Guru Nanak (page 432) by the title “Patti Likkhi”, and the other one of the 3rd Nanak Guru Amar Das Ji (page 434) under the title “Patti”. These are in the manner of the then prevalent form, but resemble the present day “Painti Akhari” of Gurmukhi. They are in the spoken Punjabi language of that period. Again, it cannot be compared with the present Punjabi in practice. Regarding compilation of Guru Granth Sahib, 5th Nanak, Guru Arjun Dev (1563-1606) alone did not collect the Banis of different Bhagats and Sufis. Indeed Guru Nanak Dev (1469-1539) and his four successors had collected the banis for 135 years, from 1469 to 1604. There is historical evidence of Guru Nanak Dev collecting the bani of Hazrat Sheikh Fariduddin Masud Ganj-I-Shakar (1175-1265), on meeting his 11th successor, Hazrat Ibrahim Farid Sani (i.e., the 2nd Farid) at Pak Patan, now situated in Pakistan. Guru Nanak also collected the bani of Bhagat Jai Dev Ji (1201-1245) from Bengal, when he was there, and so on. When we ordinary people write an article or make any statement, we take so much care to make it authentic and above any criticism, it cannot be imagined that a prophet of the stature of the Gurus, while compiling the most sacred text for whole humanity, for promoting universal brotherhood, and who for keeping it established a most marvellous place called “Har Mandir” (Golden Temple), would not have taken care regarding maintaining the originality and authenticity of the text! To preserve – and protect – the authenticity and sanctity of this text, so many measures were adopted and several sacrifices were made. One of them is by the 7th Nanak, Guru Har Rai. His eldest son, and acknowledged scholar Ram Rai was sent to the court of emperor Aurangzeb, for rendering explanation of certain misunderstood hymns in the year 1661. Instead of doing justice with the mission, he avoided facing the debate, and replaced only one word while quoting Gurbani. When his Guru-father learnt about this, he asked his son not to show his face, and instructed the Sikhs not to have any terms with him and his people. This first ex-communication in Sikhism stands valid till today, and will last forever. In every Ardas (concluding prayer), a pardon is sought, for the mistakes if any, omitted or wrongly uttered, during the recitation of the hymns of Guru Granth Sahib. “Jini naam dhiyaiya gaye maskkat ghal, Nanak, te mukh ujle keti chutti naal”. “Jini naam dhiyaiya gaye maskkat ghal, Nanak, te mukh ujle hor keti chutti naal”. “Lahore shahar zahar kahar sawa pehar”. “Lahore Shahar Amrit Sar Sifti Da Ghar”. Apart from other hymns, the chapter of “Slokas Sheikh Farid Ké” starts from page 1377. This has 130 Slokas, of which the 3rd Nanak Guru Amar Das has compiled (and added in his own name) Sloka 13 on page 1378, Sloka 52 (on page 1380) and Sloka 104 (on page 1383). This format indicates that this text was very much with the Guru Sahib, a fact which he was pleased to explain. The 5th Nanak, Guru Arjun Dev has compiled – and added in his own name – Sloka 75 on page 1381, Sloka 82 and Sloka 83 on page 1382, Slokas 105, 107, 108, 109, and 110 on page 1383, and Sloka 111, on pages 1383-1384. This shows abundantly how much the Gurus revered the original text, and kept it in tact. Apart from other hymns, the chapter of “Slokas Bhagat Kabir Jio” starts from page 1364, in which his 243 Slokas are inscribed. Out of this, the 3rd Nanak, Guru Amar Das has compiled (and added in his own name) Sloka 220 on page 1376. The 5th Nanak, Guru Arjun Dev has compiled, and added in his own name, Sloka 209 – Sloka 210 and Sloka 211, on page 1375, Sloka 214 and Sloka 221 on page 1376. On page 947 a chapter is titled: “Ram Kali Ki Var Mohalla 3,” of Guru Amar Das. Shabad No. 2, starts with the Sloka of Bhagat Kabir Ji, in Kabir’s own name, followed by the verses of Guru Sahib. For a proper understanding, regular study of Shri Guru Granth Sahib, with the aid of kôsh/translation is the best method and the true respect to holy text. Then only the message given by the 36 great souls, who lived and preached humanism and spirituality, during of a span of some 500 years from Hazrat Sheikh Farid Ji (1175-1265) to 9th Nanak, Guru Tegh Bahadar Ji (1621-1675)] can be understood. “It is desirable that every Sikh should carry on a continuous reading of the Guru Granth Sahib and complete a full reading in one or two months or over a longer period”. This is indeed is the best obeisance we can offer to the All Pervading spirit of God and learn to be true Sikhs in our lives on earth.